Getting your Washington State servers permit is just the first step. Bartending, and serving alcohol to the public, like any other job, requires a specialized set of skills. 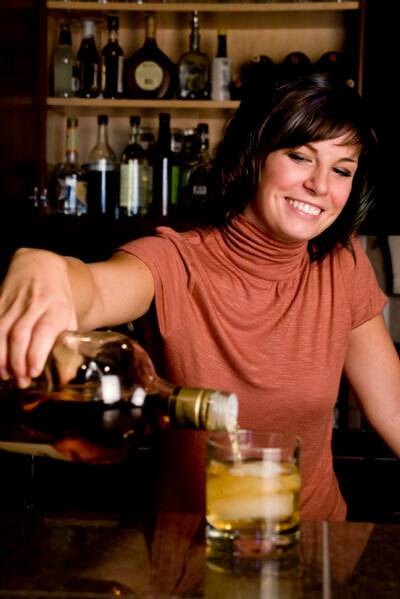 These include: mixing, shaking, and preparing drinks, maintaining a bar, and providing customer service duties. The Speed Rack is positioned right behind the bar, close to the cups and ice. This rack is comprised of a bar’s most popular liquors – vodka, rum, gin, tequila, whiskey, scotch, Triple Sec, and brandy. The reason these liquors are in close proximity to bar is that it makes mixing drinks a much easier, more efficient process, especially when the bar is busy. Flavored booze and more obscure liquors are kept further away from the bar, as they are not needed as often. Most bars will have another rack near the Speed Rack that has orange juice, grenadine, lime juice, olives, toothpicks, and an assortment of other popular non-alcoholic mixing agents. To become a bartender, you need to have a comprehensive understanding of how to mix drinks, particularly drinks featuring alcohols in The Speed Rack. For instance, it is important to know which drinks call for brandy, and which call for tequila or Triple Sec. Gaining a familiarity with these alcohols and mixers will make your first few days on the job a much easier time. Once you have the basic drinks and mixes mastered, you need to memorize bartending equipment and the different types of glasses you will be pouring into. Besides sharp knives and electric blenders, a bartender uses cocktail shakers, bottle sealers, bottle openers, jiggers, and corkscrews to make and mix drinks. After you have all of these tools mastered, figuring out which cocktail goes in which glass is important, so you are not ripping your customer (or your employer) off. Highballs, for example, are tall glasses that are used with long island iced teas, Tom Collins drinks, madras-style beverages, and screwdrivers. Tumblers – which are sometimes referred to as an “Old Fashioned” or lowball glass – are short, wide-brimmed, and thick glasses. They are used for whiskey on the rocks, as well as stingers, Black Russians, and Old Fashioned cocktails. Martini glasses are for beverages that are shaken, instead of stirred, such as cosmos, martinis, and dessert drinks, while champagne flutes are unique glasses made for savoring and enjoying champagne. Once you have the glass types, liquors, and drink styles memorized, it is important to obtain the skills required to pour drinks. More specifically, alcohol is blended, mixed, or shaken. Each of these preparation techniques helps maximize the flavor, texture, and appearance of a drink. For beverages that require shaking, fill your shaker three quarters of the way full with ice cubes. Then, pour the drink’s ingredients over the ice, beginning with the most potent alcohol your drink calls for. After everything is poured, close the shaker, hold it with both of your hands, and shake it. After shaking, strain the beverage into a glass, making sure that the foamy part of the mixture is on top. Blending drinks is a straightforward process. Simply pour the ingredients in the glass, and then decorate the drink accordingly. Popular blended drinks include: rum and Coke, whiskey and Coke, and gin with lemon-lime soda. As mentioned at the outset, becoming a bartender requires more than just learning how to prepare and pour drinks. There is a customer service aspect to the job, too. To give your customers the best customer service possible, memory, organization, and concentration are required. Over the course of one night, you will be mixing hundreds of drinks, opening and closing tabs, and handling cash and change. Besides the drinks, though, the most important component of any bartender’s job is to forge relationships with customers. A great bartender should make their customer feel important by remembering their name, remembering their favorite drink, and conversing with them about their life and job. Additionally, a bartender should enrich the lives of their customers with jokes and interesting anecdotes.